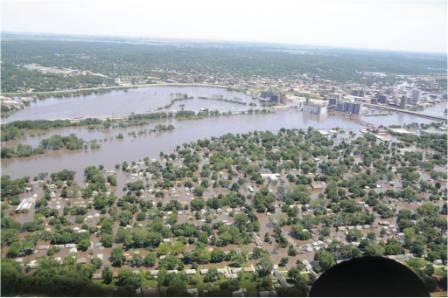 An aerial view of the flooding in Cedar Rapids in June 2008. In June 2008, the Cedar River overflowed its banks and flooded cities throughout Eastern Iowa. Ten years after the devastating floods, some local officials say the area still isn't fully prepared for the next disaster, like chair of the Linn County Board of Supervisors John Harris. "We're not as prepared as we should be after ten years. And I think Mayor [Brad] Hart can agree with me on that," Harris said. "And we're looking for funding to help." The 2008 floods displaced an estimated 10,000 Cedar Rapids residents and left 14 percent of the city underwater. But a decade later the city is still waiting for federal funding for its $750 million flood control plan. Harris says it may be time to take the issue back to voters. Harris said some of the housing and business developments that have cropped up since 2008 on both sides of the Cedar River could be vulnerable to future disasters if local governments don't follow through on a flood control system. But Linn County voters have rejected a tax increase for flood projects in the past. For now the plan to build the seven mile system of floodwalls, pumps and levees is just a plan. DNA exonerations for unjustly convicted defendants aren’t happening in Iowa the way they are in other states, and Iowa’s DNA statute has something to do with that. 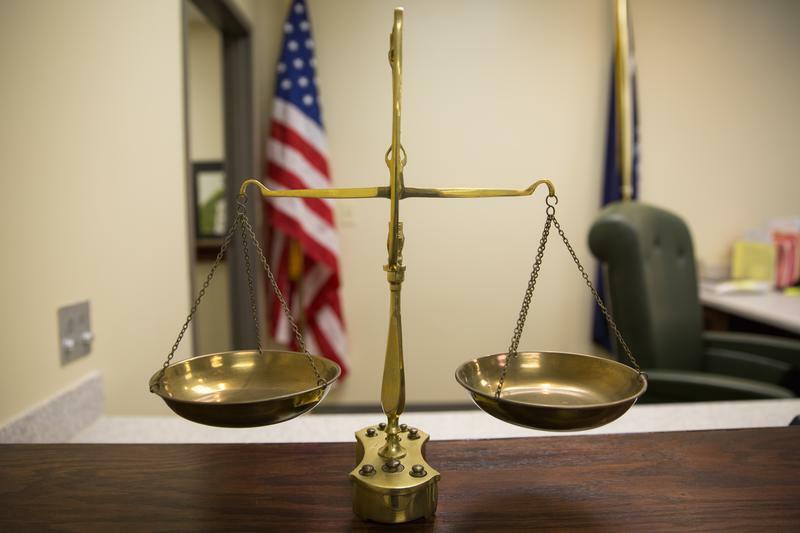 That’s what officials at the Iowa Public Defender’s office are arguing, after an unsuccessful attempt this year to update the law to make it more likely that innocent people could be freed. Assistant State Public Defender Kurt Swaim says Iowa is one of only a few states in the country with no DNA exonerations. In the final debate of the race for the Democratic nomination for governor last night, five candidates made their case for who is best qualified to take on Gov. Kim Reynolds in the general election. 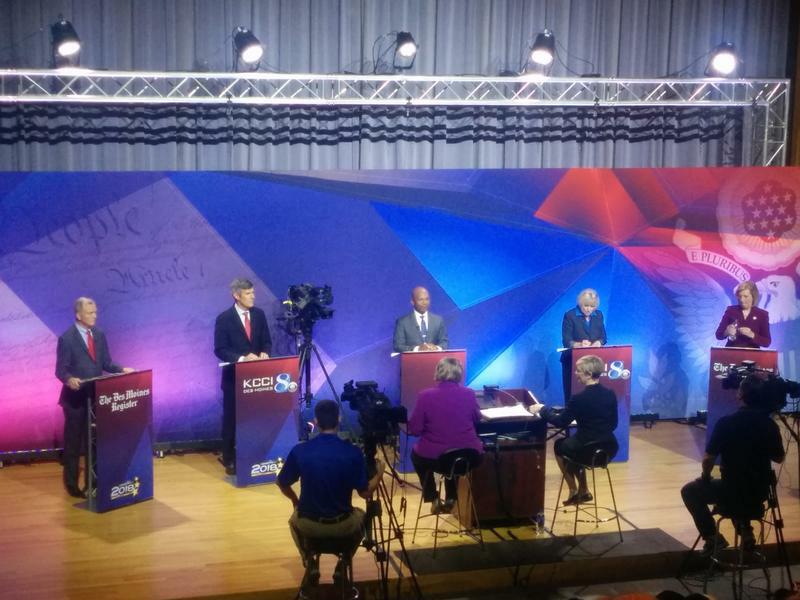 The debate was held before a live audience at the State Historical Building, sponsored by the Des Moines Register and KCCI-TV. Des Moines businessman Fred Hubbell has been leading in the polls, financing his campaign in part with his personal wealth. Iowa Gov. 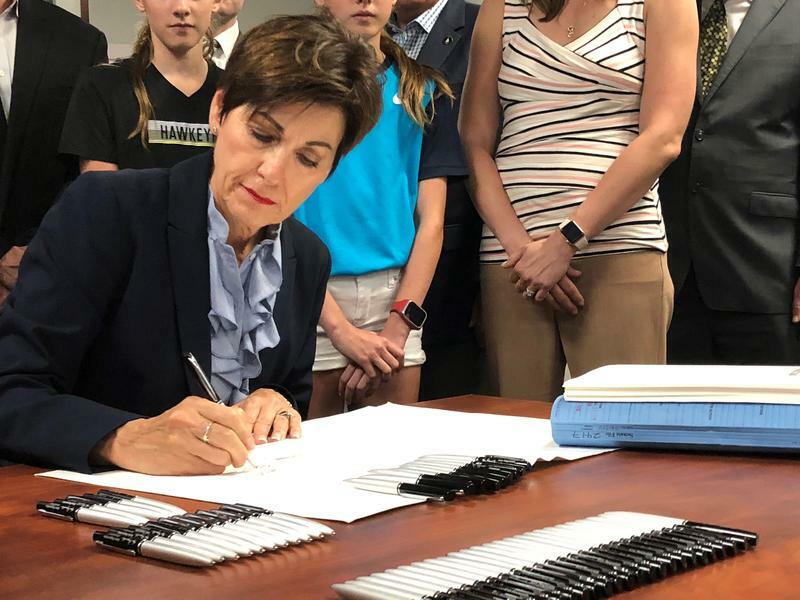 Kim Reynolds has signed into a law a tax overhaul she says will put more money in the pockets of virtually every Iowan. Despite concerns from Democratic state lawmakers and some voters, Reynolds says the changes are significant and sustainable. 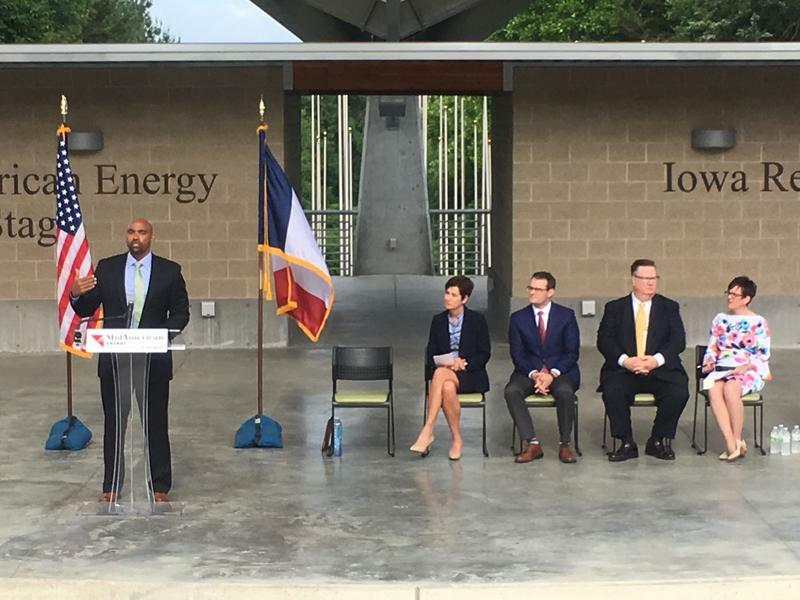 A proposed wind project in Iowa could make MidAmerican Energy the country’s first utility to generate renewable energy equal to 100 percent of customers’ annual usage. The company announced this goal two years ago. On Wednesday, MidAmerican Energy President and CEO Adam Wright said last year, just over half of the energy produced by the company came from wind. Black Hawk County officials are considering two offers to take over the county-run nursing home. But some community members don’t want the center to be privatized. 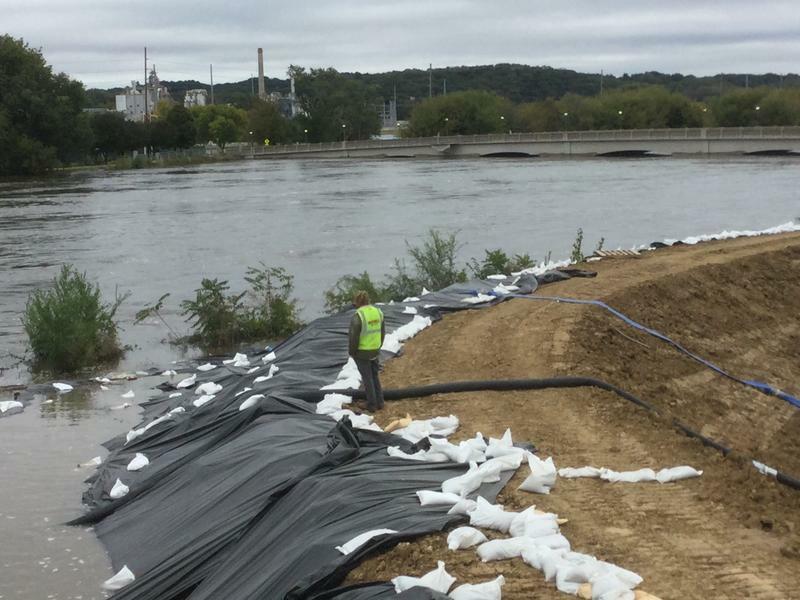 The mayor of Cedar Rapids says cleanup continues from the second-biggest flood in the city’s history earlier this month. Ron Corbett says unlike the devastation from the record flood of 2008, most property damage this time was limited to basement flooding. And, he says, businesses in the flooded area were mostly hurt by lost customers. “Most of the business damage wasn’t from property damage, it was the damage from lost revenue when they had to close down for a week or so,” he said.